It’s been a while since I’ve been to the Apple Store (my home, away from home)! The nearest one is about 45 minutes away, so I don’t go that often. I was meeting some friends for dinner last night at that area, so I had to stop by. Albert and I are heading back to the Islands — one of our favorite vacation spots! — and we would be greatly honored if you could accompany us for a lunch tweetup. We would love to meet all of our Hawaiian Twitter friends in person. Feel free to invite friends! For more information and RSVP, please see bit.ly/hulaween! Another Blog World Expo has come and gone. This is actually my first Blog World Expo event, and I greatly enjoyed it. There were just so many amazing sessions taking place that it was very hard to choose which to go to. In addition to the panels, I met a lot of amazing people who are changing our world through social media and online tools. 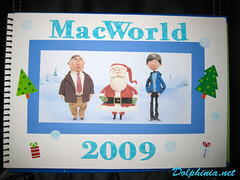 I’m heading off to Blog World Expo 2009 tomorrow and I’m so excited! It’ll be my first Blog World event. 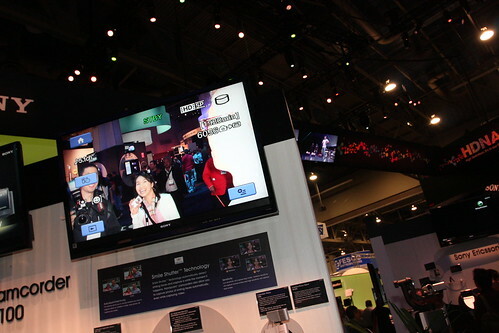 I did go to New Media Expo 2008 last year, but now the two conferences are combined into one. BlogWorld & New Media Expo is the only trade show and conference created for the industry of blogging and new media. It will give participants the strategies, tools and technologies they need to stake their claim in the blogosphere. It’s a great conference to learn from the industry’s top leaders. There’s so many great educational opportunities and all the panels look great, it’s hard to choose just one for each time slot! The conference will cover various areas of blogging, new media, and so much more! If you have an iPhone, be sure to install the Blog World Expo Sched iPhone app. It will also sync with the schedule you created online. Here is my schedule. Also be sure to stop by the Exhibit Hall for sessions at WordCamp Las Vegas. I will be attending as iProng Magazine’s correspondent. iProng Magazine is the publication for iPhone, iPod, music, podcasting, and social media lovers. There are many reviews of iPhone apps, iPod accessories, and interviews with musicians. Check it out if you haven’t already! Best of all, it’s free! Also, if you haven’t registered for BlogWorld yet, you can still get a 20% discount using the code IPRONGVIP. I’ll see you there! Comic-Con is where geeks meet annually to celebrate their passion for comics, science fiction, fantasy, and their inner-geekiness! Many dress up as their favorite comic book characters and pose in photos, getting a dose of the celebrity life for a weekend. Comic-Con is also where many long-awaited special announcements are first heard, and I believe the best surprises this year came from The Guild panel. So what is The Guild? Itâ€™s an online comedy show about the online and offline lives of a guild (group of gamers). Whether you play games or not, itâ€™s worth checking out. Youâ€™ll find yourself laughing at all the characters, because we all know people in real life that reminds us of each character! The Guild panel was on Friday morning, and to my surprise, the line was wrapping around the hallway! Every seat in the room was taken, and many of the attendees stood against the back walls. The session was quite packed! I just registered for the first WordCamp LA and I’m super excited! There’s a lot of great speakers and they’re adding more each day. What is WordCamp you may ask? It’s a conference that focuses on everything WordPress. Attendees include the casual users, designers, plugin developers to the core WordPress developers. If you have the slightest interest in WordPress or even blogging, I highly suggest you attend! The first WordCamp LA will be taking place on Saturday, September 12th, 2009 at Loyola Marymount University, which is very close to LAX airport for those of you coming from out of town. Tickets are selling fast, so be sure to get yours soon! I’ll see you there! I’m up in Northern Cali this weekend again to visit relatives. My cousin goes to school in the city, so Uncle and Auntie asked @dragonal and me to take her to her apartment. 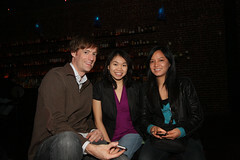 That was a great opportunity to have a SF Tweetup! So I planned a SF Swig Tweetup in the morning, and met up with everyone later tonight. It was nice! Traffic to the city was kind of bad, so we didn’t get a chance to eat a big meal. We met up with @hotmilkgt and had dinner at the pizza parlor called Milan’s. I tweeted that, and who should walk in but @tonydg and @mr_o? ;) Funny. Now I wished I lived in SF… friends are just within walking distance! @inferno10 @emilychang @mingyeow @kyeung808 @ckueda @hotmilkgt @tonydg @mr_o @mcnitt — Thank you for meeting up with us! We had a great time! This year was the first time I’ve been to CES. It’s fun, exciting, and very exhausting! There’s just so much to see and do. One day was definitely not enough time. The one booth that caught my eye was definitely Sony. They had live music, a Jeopardy game going on, and lots of new innovative technology. The 3D TV screens were an interesting idea. We were given 3d glasses to watch the movies on the screen. It’s quite amazing. It’s like having a 3D theatre in your home. I can’t say how useful that is.. unless you’re watching special 3D movies though. Very cool idea, but not too practical (for me) in my opinion. The super thin LCD screen was so amazing. They can bring the “zen” look to any house! And I absolutely loved the new cameras with the Smile Technology! By default, the camera will take photos only when you smile! These new cameras use face-detection and smile technology; amazing stuff. 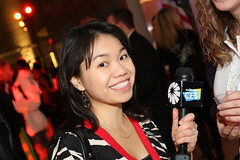 While at CES, I also went to the “It Won’t Stay in Vegas CES Blogger Party!” The party was amazing. I love the energetic atmosphere. There was great music, excellent swag, and incredible people! 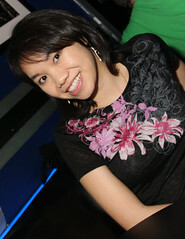 After Robert Scoble’s party, I attended a GeekBrief Tweetup. Fun! I finally got the chance to talk to Cali and Neal (in a more quiet place). 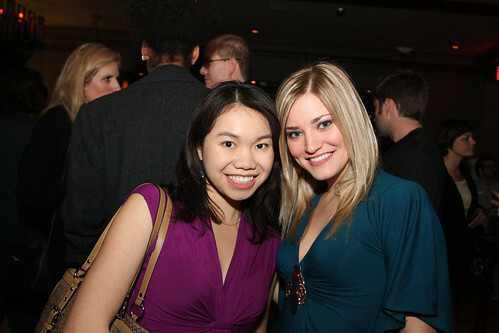 :) And I met some amazing people at the tweetup as well. I had a great time in Vegas during CES. I can’t wait til next year… Jan 7-10, 2010! 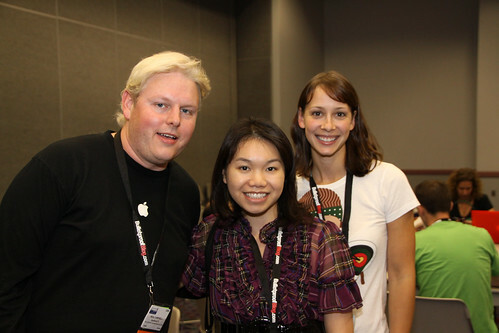 Macworld SF 2009 for me has been a great experience. I didn’t spend much time at the Macworld event itself, but all the little events in and around San Francisco for the few days were all very nice. My plane finally landed in SF on noon on Sunday, and I spent the day with my college friends in the city. We had lunch there and walked around Union Square. It was a lovely day. We spent the night driving to Sunnyvale to meet up with some other college friends. Monday night came, and our crazy tweetup at 21st Amendment was underway. It was so nice to see everyone! There were a few surprises too. :) Thank you all for coming and making the Tweetup so much fun! My Tuesday was really short. I browsed around the Macworld show room for a bit, and had to catch my plane. I was happy to see Veronica Belmont walking around. And I caught a live taping to Macbreak Weekly with Leo Laporte. I made it out to the first LA Tweetup at YogurtLand! It was fun seeing @christinelu again, and meeting her son, @mikeprasad from gamerGirl, @rocknrollgeek from TechZulu, and @jspepper from Pop! PR Jots. Excited to see each other, we forgot to take photos of the yogurt! But you can trust me when I tell you that it was very yummy. ;) My favorite of course is Taro! You have to try it! After dessert, @mikeprasad, @rocknrollgeek, and dragonal went walking around Little Tokyo to get a snack. I know, it’s a little backwards. ;) We had weird eating habits that day. I was happy and sad all at once, knowing this was the last meal I’ll have in Hawaii with my friends on this trip. But that just makes me count down to the next time I’ll visit. 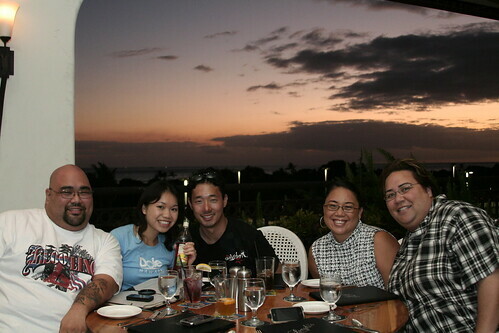 <3 my Hawaii Twitter friends. I can’t wait to see you again soon!! We had a two hour or so lunch at Nico’s at Pier 38. Great location! We talked about all sorts of things, from cameras, to the best snorkeling spots, to iphones and web development. Loved it! Here’s a short clip of the Tweetup. I took while Hawaii was Qikking us. More people came in after this photo was taken! TechCrunch50 is a conference with the goal of finding the best start-ups and launch them in front of our industryâ€™s most influential VCs, corporations, fellow entrepreneurs and press. I’m always excited to learn about new startups and technology ideas. That’s why I’ve been obsessed with listening/watching the TechCrunch50 stream online today. Yes, I was there virtually! Of the ones I saw, I thought BlahGirls, Angstro, DotSpots, and OtherInbox were the more interesting startups.